Please join me in welcoming Ashley Taylor from disabledparents.org. 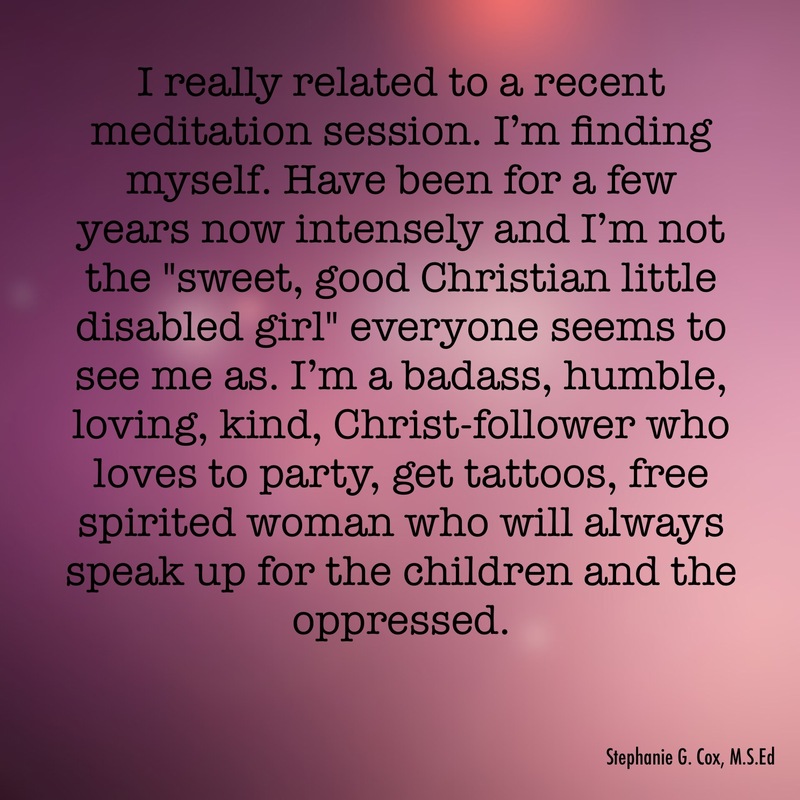 She is a parent with a disability and so when she asked me if she could guest post on my blog, I was delighted. I have severe cerebral palsy but I don’t have children and sometimes that’s held against me. So here’s a parent with a disability that is treating her children respectfully. I hope you will enjoy her posts. Childproofing a home before a baby arrives is a challenging chore for any expectant parent. And it can be especially daunting for parents to be who are dealing with disabilities. But getting an early start and tackling tasks systematically can help make your home safer for you and its new occupant. Here is some information and advice to get you going. Research shows there were 4.1 million parents with disabilities in the United States in 2014, or around 6.2 percent of parents with children under 18. And, though attitudes are starting to shift in some states, the majority have dependency statutes that allow courts to reach the determination a parent is unfit based on the parent’s disability. So, while it is important for every expectant parent to establish a safe environment in their homes, it could be even more critical for those whose skills might be scrutinized by well meaning family, friends, and officials. Fortunately, some agencies provide services specifically designed to assist prospective and expectant parents with disabilities plan for life after labor or adoption. Services could include home visits to evaluate areas for safety purposes, lending out adaptive child care equipment for people to try before they buy, and performing follow-up visits as the baby ages. Advocacy agencies such as Through the Looking Glass are a good place to start when seeking resources and training programs. There are some things you should mark off the child proof checklist prior to a baby’s grand arrival in its new home. Here are some suggestions from sources including Redfin. Install carbon monoxide detectors if you have an attached garage or use oil or gas to heat your home. Check batteries twice a year. Install and maintain functional smoke detectors. Check them monthly and change batteries at least once a year if your detectors require them. Keep a fire extinguisher on hand and have a fire escape plan in place. Keep nightlights away from fabrics, including bedding and curtains, and opt for night lights that don’t heat up when used. Put together a first-aid kit for babies and take an infant CPR class. Install childproof locks on cabinets containing poisons, medicines, and cleaning supplies. If your home has lead paint that’s peeling or flaking, hire a certified Lead-Safe professional seal or remove it. Make sure your water heater is set no higher than 120℉ to minimize the risk of accidental burns. Install plates that slide closed over electrical outlets. Cover sharp furniture edges with bumpers or padding. Stony or sharp fireplace hearths should also be covered and expectant parents should also install heat-resistant gates for when the fireplace is in use. Put non-slip pads under area rugs that don’t already have non-slip backs. Anchor heavy furniture that could tip over, such as dressers and refrigerators, to the wall or floor. Consider investing in baby gates to block off areas that you plan to keep off limits for your little one, but avoid accordion-style gates that they might get stuck in. For rooms with doors, try knob covers that make it doors difficult to open for little hands. Test some options early to make sure they also meet your accessibility needs. Install window stops or guards. Clip looped window blind cords and install safety tassels. Fit blinds’ inner cords with inner cord stops. Review safety suggestions and product recalls before buying furniture for the baby’s room. There will be other childproofing considerations once your baby starts crawling and walking, but this list gives soon-to-be parents a strong start toward creating a home that will help keep all its inhabitants happy and healthy for years to come. Note: Daniel is a wonderful Christian gentle parent. This post really touched me as I have severe cerebral palsy and I always really appreciate when parents let people know that having children with disabilities is tough, but also very rewarding! Going to tackle a tough question that comes up from time to time. Has having children with autism ruined my life? Is this the worst thing that could ever happen? Aizen’s needs in particular have posed some tremendous challenges to us to understand and learn — and honestly there would have been a time I may have answered yes to this question. Age five, before we were getting support and help, was a particularly rough time because he was biting and aggressive and we didn’t know what to do. He also wasn’t talking which made things extra challenging. But did it ruin my life? No — I have had to grow significantly and I had a lot to learn. I have gained skills, understanding, empathy, and knowledge I would never have gained otherwise. Aizen has shown me the world in a way I would never have observed it without him. He has changed the way I perceive behaviours in other people and taught me patience and empathy in stressful situations. Has this ruined my life? I’d say the opposite — what I have gained would be enhancements. I am also a bereaved parent and I stress that Aizen is alive, gaining skills, observing and experiencing the world — he’s not broken, damaged, a burden or a problem. The worst thing that can happen — and I know from experience — is your child passing away and having plan their funeral. He’s a good polite kid who has worked extremely hard for every skill he has acquired — he’s someone who should be celebrated. I tell the story of both of my kids in regards to running into streets/parking lots to a lot of people because that question comes up so often. I found peaceful parenting when my first was about a year old. We don’t do any punishments or rewards with our kids. I don’t yell at my kids and I don’t use the word “no” very often. It’s not that I let them do what they want (we have some pretty firm limits on certain things), but I had learned that children will begin to tune out the word “no” if they hear it to often so I try to use different ways to tell them when we can’t do something. So anyway, when my first was a little over two, we were leaving a building and my hands were full. She was always great about walking with me but this time she took off out the door running towards the car, (which was parked right outside the door) but she was headed to the back of the car because she knew I was putting stuff in the back. It’s a little used parking lot but at that moment someone came tearing into it at a rate of speed not really appropriate for a parking lot and it scared me to death that she would run out from behind our car, the other driver wouldn’t see her, and he would hit her. There was no way I could catch her. I shouted “STOP! !” She immediately stopped, turned back to look at me, and came straight to me. There was no fear in her eyes, only trust. She knew I wasn’t going to hurt her and she also knew that mom never uses that voice to talk to her so this must be super important. At that moment, I was so thankful that I don’t yell at or spank my kids. Exact same reaction as my first daughter. She immediately stopped, turned to look at me and came to me. I don’t know if the result would have been the same had my parenting styles been different. Maybe it would…..but I have my doubts. I think peaceful parenting saved my kids’ lives. I also think that even if spanking would accomplish the same thing, why use it if a peaceful alternative works just as well or better? People who spank seem to believe that if they don’t spank, the only other alternative is to let the kids run wild, rule the roost, and become tyrannical delinquents. But for those of us who have stopped spanking, we know how hard it is to “do” something without hitting. Just recently my 10 y/o and my 8 y/o had a conflict. The 10 y/o was mostly at fault. She’d called her little sister a name and pushed her. When things like this happen, it triggers the old spanking circuits in my brain. Everything inside me wanted to scold her, yell at her, and punish her…to make her suffer for having done wrong. So I called her to come talk to me and gave myself a quick “pep” talk as I waited for her. I resisted the urge to scold and punish…and chose…to discipline instead. I asked her if calling her a baby helped the situation. I asked her if when she got mad at her little sister for being rude to her, if calling her a baby was polite. I asked her if calling her a baby taught her little sister not to do what she’d done to irritate her again. And I asked her why she did it. Her answer was typically childish. In her mind she did it because her little sis had irritated her. (I know grown-ups who think this way). So I asked her if she could have done X, Y, and Z (different examples) instead of calling her a baby. I used some funny examples too that made her smile. But with the examples of other choices she could have made, I helped her then to see that because her sister did something, it did not make her make the choice she had to call her sister a baby. SHE made the choice after her sister irritated her. She could have made 1,000 different choices but she chose to call her sister a baby. She chose to be mean. As we talked, tears came to her eyes several times usually when I asked the right question and I could see she came to the right conclusion. But the whole time her eyes and attention remained focused on me. Then she told me some things that have been bothering her about what her older siblings have done to her, and more tears came. We talked about those things and I encouraged her not to follow their examples. THIS is what happens when you don’t spank your children. Had I still been a spanking parent…this would have ended in 30 seconds with a few whacks of a paddle, resulting in tears of pain and an obligatory apology. But instead it took 10 minutes and ended in tears of thankfulness and understanding. NOT spanking is more painful for the (usually busy) parent in that it takes a lot longer to handle things…and takes a lot more mental energy, willpower, maturity, thoughtfulness, and creativeness on the part of the parent…but the results are worth the effort. They twist the words, thus, making us out to be fools. They are very good at their verbal gymnastics. I fall to the floor; the grief within my heart weighs down on me like a boulder. Tears flow down my cheeks, like a river. I weep for thousand years. Oh, *Kinderen van mijn hart, they hurt you, and they confuse your minds, they make you believe that you deserved it, that it was love that drove them to do it. Oh my dear little ones, so young, so trusting, and they twist that and warp that. Oh beloved Papa, the darkness consumes and devours, distorts and destroys. How dare they use Your name! How dare they say it’s Your will and Your command! For what they do is of great darkness. To wound a child like that. It is not just the body they harm, but also the heart, soul, spirit and mind. They say that they do it out love, but what kind of love would force a child into a helpless position and strike them, inflicting pain and fear? While within their hearts, they have great love for their children, but what drives them to slap the buttocks is not love, but fear. It is fear that drives their hand. Fear of what will happen if they don’t. Fear of what others will think if they don’t. Fear of what God will do to them if they don’t. Oh, what a twisted web of deception, those who sit on their thrones and tell us what to do, that their way is the right way. Why have we made them our “gods,” and obey them without question? They are mere humans, like us. So why do we take their words as if they are holy? Just because their kids appear to be wonderful, productive, and responsible citizens. We know that things aren’t always what they appear. How many times have horrible crimes become known and we cry out in shock, because we really bought the act that person was playing. We say, “how could they have done that?” They were such a good person and we list off all the things that we believe makes someone a good person. Are spankings from God? Does spanking cause a child to fear? Is there fear in love or does love cast out fear? Does it cause a child, when they have done something wrong to lie, hide and escape a spanking? Does spanking soften a child’s heart or does it harden it, thus, they have less compassion for their sibling who gets spanked too? Does it produce life, light, and love? 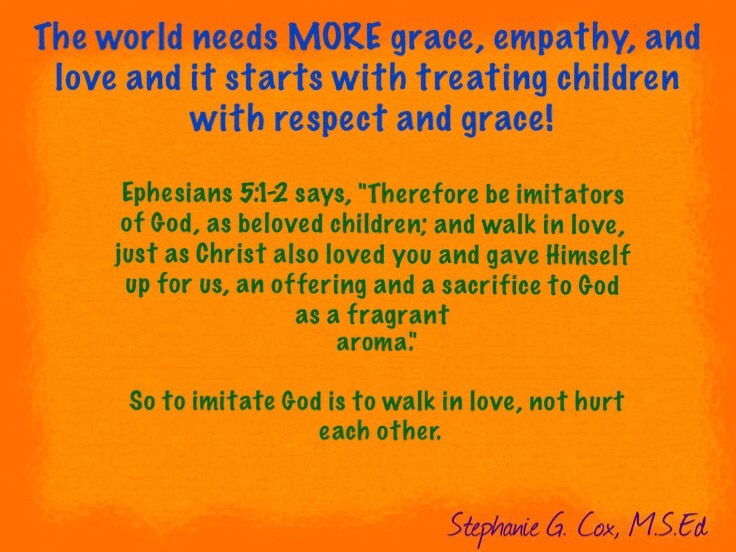 Does it produce peace, gentleness, kindness and compassion for others? What is the fruit of spanking? When I read these words, my heart becomes broken. If this person is the posterchild for a properly spanked kid, then we all should weep until there are no more tears to shed. When Jesus was here on earth and was with people, who was the people He hung out with? The very people this person is calling names. Our Papa does not see any of His children in this light. Yes, He sees all of our brokenness and wrongdoing. But, that doesn’t cause Him to despise us, rather, it moves His heart with compassion. Tears fall from His eyes, for He feels our pain and empathizes with our struggles. 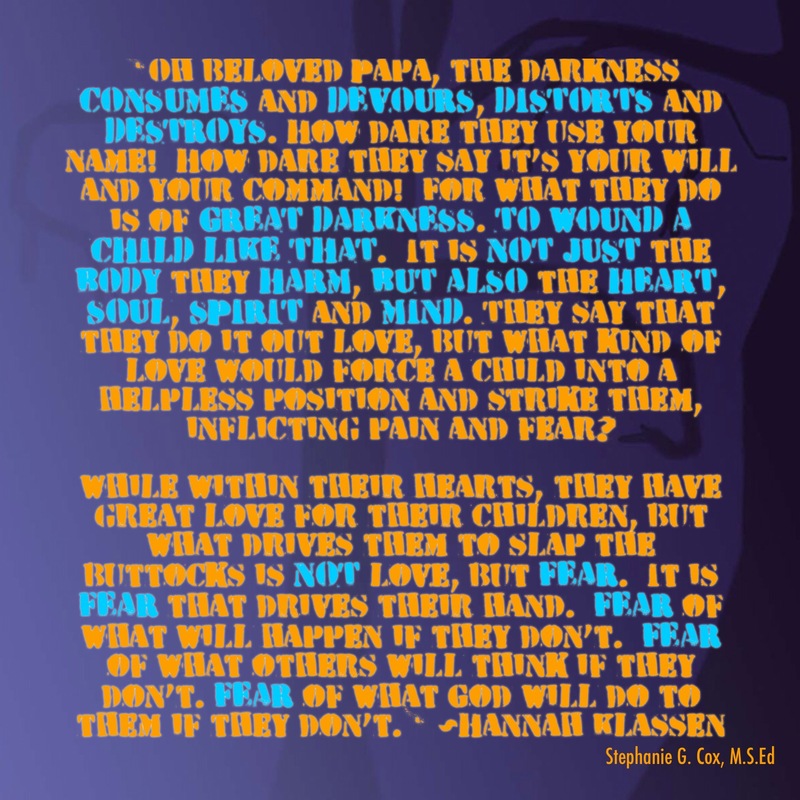 When we’ve really screwed up and feel like a piece of (expletive deleted), what does Papa do? He embraces us, holds us in His arms, and tells us over and over again that He will love us forever and ever and there is nothing we can do that will ever change that. He pours His love upon us, with eyes so soft and caring, with a face of such affection, this is our God, this is our Papa. *Kinderen van mijn hart (children of my heart).